Well isn’t this exciting? 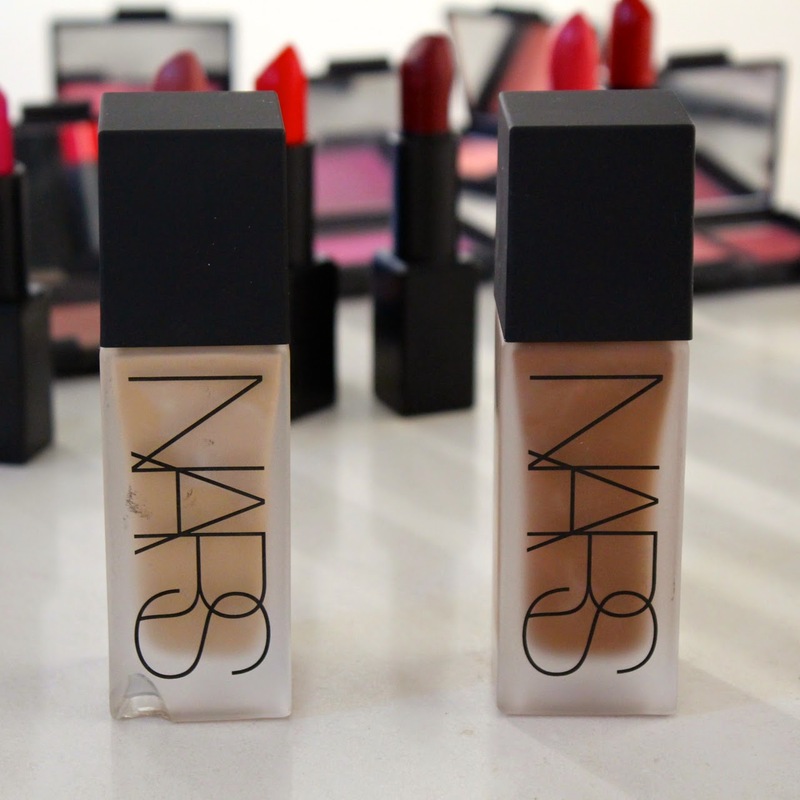 Meet the new liquid foundation from the hands of Francois Nars. Out in Spring 2015 for a sum that has yet to be determined (I’ll update this as soon as I know specific details), this foundation adopts a title so outlandishly promising that I squealed upon seeing it written on the press release. Say hello to the All Day Luminous Weightless Foundation. They couldn’t fit more adjectives if they tried, could they? And it’s a title so long that I am going to have to adopt usage of an acronym for the rest of this post – ADLW. Last a long time – this one says it will stay on your face for up to 16 hours. That’s a hell of a long time. Impart luminosity – AKA give a full, natural looking finish in a single drop. Feel like nothing on the skin – weightless enough to make you forget you are wearing foundation. It comes in 20 shades – the shades mimic what you see in the Sheer Glow range which is a nice bit of consistency and although I cannot confirm this for you as I haven’t had access to the entire range, should mean that Sheer Glow wearers can easily transfer to ADLW. It’s oil/paraben/alcohol/fragrance/SPF -free – it’s not intending to clog your pores, give you painfully embarrassing flashback in photos or irritate you with an artificial scent. So that’s the spiel I have accrued from the press release. It all sounds wonderful but let’s get down to the nitty gritty. What is it like from a consumer perspective? How does it compare to the rest of the market? Well I’ll tell you this. Although NARS wants you to believe that this is an innovation in formula the reality is that there are already very similar products on the market. At this point you need to think YSL Fusion Ink and Giorgio Armani Maestro. It’s one of “those” types of foundations. Sure, the ingredients are undoubtedly different and this is certainly not an exact duplicate of any of these but let’s break it down: the feel is the same. It’s that light, non-cakey, skin like finish that looks and feels natural once set on the skin. What I will say about the NARS foundation however is that the coverage is far better. The brand claim that a single drop, from a single pump of the bottle (yes the bottle comes with a pump – hurray!) will give you all you need for your face. I would agree with that (provided you use fingers and don’t let the product get sucked up into a foundation brush) and when compared to the other brands the coverage is more opaque and less watery, particularly when lined up with Maestro. And what is it like to wear? I have worn this for 3 days and the one aspect that I really like is the natural looking coverage it gives. This is foundation that you can truly fool those close to you with. You could use a liberal two pumps, layer it on to ensure absolute full coverage, and it would be highly unlikely that anyone could tell you were wearing anything. There is no shimmer, no sparkle, and no overly dry or matte finish. It’s just like your skin – but obviously much, much better. Pointless selfie added here: me wearing ADLW in Fiji and a lot of other makeup. I have alternated applying it with a brush and with fingers and I have concluded that a hybrid approach works best. I place it on with my fingers and then use a brush to work it in. You do have to move fast for an even finish, something that Simone also found in her recent review video, but once it’s there it sets quickly. And at that point I leave it. I don’t use powder as I really don’t feel like my skin needs it – it’s that skin/demi-matte finish that I feel could have a tendency to highlight dry skin. For me then it’s just blush and go. Oh and concealer under the eyes because this really does absolutely nothing to disguise that area. 16 hours later…it’s not really there. I do think that claim is a little outlandish but I forgive them. I rarely need to be wearing a foundation for that length of time and even if I do, I am very happy to perform the 5pm touch up ritual. So far, so fabulous….but…but…there are two personal preferences that hold me back from giving this a total declaration of love. Texture – I just cannot get on board with the texture of these foundations. It gives me the silicon shivers. Maestro did it. Fusion Ink did it and now this does it as well. I personally prefer a gel/thick cream formula. Call me old school, I really don't care. I like what I like. Finish – this is Matte-Light. It gives skin a very natural texture but you know what? I don’t want that. I want glowing (read: plastic perfect) skin. I want what Laura Mercier Silk Crème and Clarins Extra Comfort give me. I think this is a result of my skin type. I have dehydrated/normal skin and so a foundation like ADLW will always fall slightly flat on me. If my skin had a higher level of oil in it I think I would feel completely differently. I would definitely be interested to see how this performs in higher humidity levels for that reason…who knows, once I get my sweat on, and some natural oil hits my face my like for this foundation could rapidly turn into a love. As I said at the beginning of this blogpost, this comes out next year although I haven't been told when, so standby! I cannot wait to hear what you all think of it! PS. When you do get it try to avoid dropping the bottle - that frosted glass will easily chip...see the bottom left corner on the lightest shade above. Next year best come round quickly! 😜 definitely one I will be trying!! I've never really been on board with NARS foundations and I'm not sure about this one. I have normal to dry skin and love YSL's Touche Eclat foundation and Armani Luminous Silk. I wonder if this would do it for me? I have recently fallen in love with Laura Mercier Smooth Finish Flawless Fluide, wich shares both the propensity to ridiculously long names and the characteristics of a lightweight and skinlike foundation. Personally I am loving this new wave of foundations! I think I will sample it or pass. Those types of foundation tend to work better with oily skin than my dry skin. And it's hard to beat Revlon Colorstay or Smashbox 15 hr. for a long lasting formula. Yes, I immediately thought of the YSL Fusion Ink foundation too which is my current foundation of choice (surprising for a Winter foundation but I'm an oily girl and this is my saviour!). I definitely like the sound of this though as full coverage mixed with weightless feel is ideal, especially oil free formula. I suppose everyone has different preferences as to what sits best on their skin. As much as I adore the YSL one, I can't say it's 100% the best foundation I've personally tried. Definitely one I'll keep an eye out for.... fab review, so detailed! I have been a big fan since the Lollipop26 days, and I still enjoy your posts. However, I was wondering if you are an ambassador for NARS now? Many bloggers are sponsored, and I feel your posts have shifted a bit. Either way, your complexion is flawless, and I can't wait for your eyebrow review! I'm definitely one who prefers the plastic-perfect type of finish, so this is yet another foundation that I will most likely purchase on a whim (because I will have forgotten all about this review... darn my forgetfulness) and regret later on. It is so hard to find a light foundation that gives you a flawless finish! That looks like a foundation I would love, although I prefer one with SPF. I don't mind the flashback, somehow I don't get stalked by paparazzi on a daily basis, so it is only a concern on special occasions. This is such a fantastic review and got me thinking how the 'best' foundation for one skin type can be the 'worst' for someone else. I'm still partial to my Clinique Even Better that I've been using for 5+ years! It sounds really interesting, I can't wait till it comes out. I've never tried any of those types of foundations but I'm intrigued! I'm always looking for foundations that look like skin. Thanks for the information! You look gorgeous as always. Your blog is awesome! This is a quintessence of beauty, of loving yourself as a woman and a desire to become better. Thank you for inspiring girls and women to take care of themselves, thank you for making reviews of cosmetics and the latest innovations in the fashion world. I would like to share information about you on my english writing helper blog if you do not mind. I always read your posts when I writing a dissertation. I stop to be nervous and enjoy reading your notes. Thanks a lot! Stay always so beautiful and positive!